Partner media release from The University of Sydney. An Australian group was the first in the world to confirm the radio emission from a gravitational wave event, discovered by collaborators in the United States being announced today. The discovery of gravitational waves in 2015 was awarded the Nobel Prize for physics this year. The discovery of these ripples in space-time, produced by massive, accelerating bodies, like orbiting black holes (which cannot be seen directly) or neutron stars, confirms a prediction made by Albert Einstein in 1916. Now, a group led by Associate Professor Tara Murphy, from the University of Sydney and the Centre of Excellence for All-Sky Astrophysics (CAASTRO), has confirmed radio-wave emission from a gravitational wave event discovered on 17 August this year. The results are included in a Science paper published today with co-author institutions including the California Institute of Technology (Caltech) and Oxford University; simultaneously teams from the international science community are publishing related research in other leading journals, demonstrating the second epoch in gravitational waves discovery. Scientists representing LIGO-Virgo, and some 70 observatories today reveal the gravitational waves discovery – the first to produce light and radio waves, not just gravitational waves. The explosion, produced by a pair of neutron stars merging, took place in galaxy NGC 4993, about 130 million light-years away. The first follow-up detection was optical, about 11 hours after the event, and was detected by a number of groups worldwide. X-ray emissions were detected nine days later and radiowaves after 15 days. University of Sydney Associate Professor Tara Murphy, who leads the radio astronomy follow-up in Australia, said she was in the United States with colleague David Kaplan when they saw the gravitational wave announcement come through on the private email list of the Advanced Laser Interferometer Gravitational-Wave Observatory (LIGO). “We immediately rang our team in Australia and told them to get onto the CSIRO telescope as soon as possible, then started planning our observations,” she said. PhD candidate Dougal Dobie spent hours observing on the telescope. The team used the CSIRO's Australia Telescope Compact Array to monitor the gravitational wave event for more than 40 hours over several weeks. Dr Douglas Bock, Director of CSIRO’s Astronomy & Space Science team, said this extraordinary detection by an Australian team, using Australian facilities, made a significant contribution to the global discovery. “Running a national facility involves providing researchers with access – fast – so they can monitor unexpected astronomical events of extraordinary scientific interest,” Dr Bock said. University of Sydney Vice-Chancellor and Principal Dr Michael Spence said: “This international discovery, with Sydney playing an integral role, demonstrates that the best science and modern innovation is intrinsically a collaborative effort. “What a terrific way to confirm that Einstein’s theory of relativity was correct, gain insights into massive bodies like black holes and, with this knowledge, start to re-think our understanding of the Universe,” Dr Spence concluded. 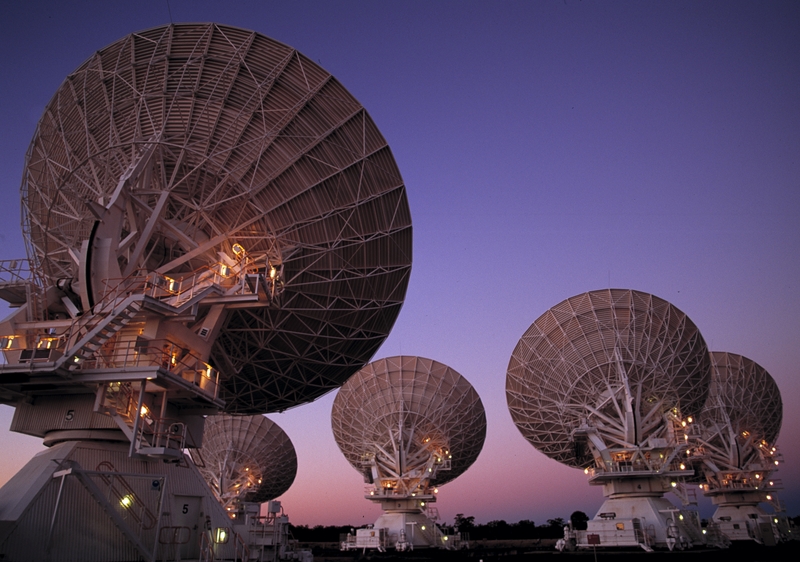 CSIRO’s Australia Telescope Compact Array radio telescope near Narrabri, NSW. Credit: David Smyth/CSIRO.